Most manufacturing facilities today capitalize on the most advance equipment technology to increase production output and minimize labor costs. However, many manufacturing plants still use manual methods like brooms, dustpans, and wheelbarrows to clean facilities. It is true that some facilities utilize store bought shop type vacs in their housekeeping routine, but using one of those in an industrial setting is like using a glue gun in a factory that was purchased at a craft store. With a manufacturing operation that is in constant motion, scheduling time-consuming manual cleaning means lost production and lost profit. However dreaded the task, housekeeping is absolutely necessary for health, safety, machine performance and product quality reasons and therefore these interruptions in production are accepted as standard operating procedure. Perhaps there is a lack of knowledge that industrial vacuums are capable of sucking up to six tons of material per hour, or that industrial vacuums filter fine particles up to 0.3 microns, or that industrial vacuums can cost as little as $1000. More to the point, most manufacturers are probably unaware of the cost benefits such as better product quality, material reclamation, reduced wear and tear on equipment -- meaning less downtime for maintenance and repair costs, longer production runs and probably the most significant savings, reduced labor cost. Across nearly all industries, most production systems are designed to produce multiple products on a single line. In order to make this process cost effective, turnaround time on setups must be efficient; but manual cleanup or the use of inadequate equipment can reduce the ROI of such systems. Employing industrial vacuum systems to remove dust and debris can save companies tens of thousands of dollars per year in term of materials, labor and equipment, as was the case with a solid surface and marble fabricator. Prior to employing a central vacuum system to handle the large volume of fine heavy dust produced by sanders, routers and miter saws, each station used shop type vacs that not only needed to be emptied and cleaned several times a day, but they also got in the way of the equipment operators and allowed abrasive particles to settle into machinery and equipment, reducing equipment life. Now drop-down hoses hang conveniently over each station with quick connects that allow dust to be pulled directly off equipment at its source. Since the dust is immediately removed from the sanders, saws, and routers, the company is getting about 20 percent more life out its sandpaper and equipment; and its staff is more productive because they no longer need to leave their stations several times a day to dump and clean the shop type vacs. The company estimates that it saves $20,000 per year in material, equipment, and labor costs. Consulting with an expert in vacuum cleaning systems can increase a company’s bottom line in a variety of ways. Companies like VAC-U-MAX, often have off the shelf solutions that can be custom fitted with accessories to meet a manufacturers housekeeping needs. 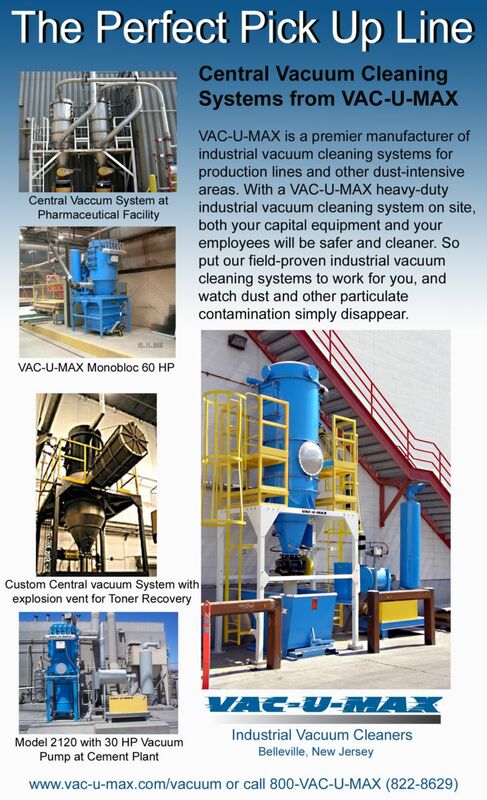 VAC-U-MAX is a premier manufacturer of industrial vacuum cleaning systems for production lines and other dust-intensive areas. With a VAC-U-MAX heavy-duty industrial vacuum cleaning system on site, both capital equipment and employees are safer and cleaner.